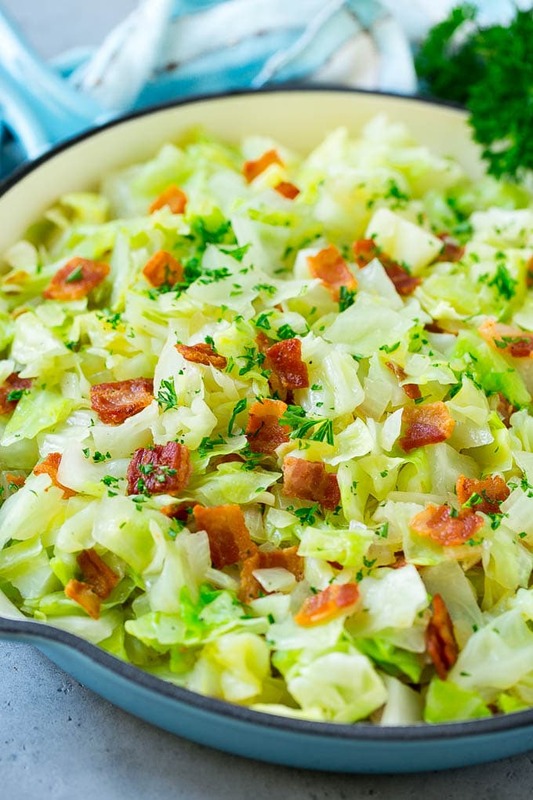 This fried cabbage is cooked to tender perfection with bacon and onions. A super easy low carb side dish that’s perfect for any occasion! Cabbage is such an underrated vegetable in my opinion – it’s inexpensive, available year round, and totally delicious! 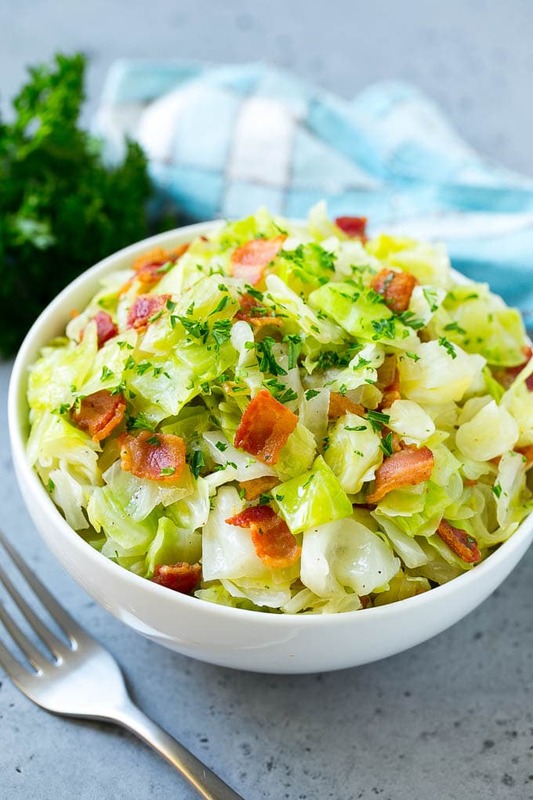 This simple preparation of fried cabbage is a classic recipe that pairs green cabbage with bacon. Once you try it, you won’t be able to stop eating it. Cabbage is one of those things that most people never think to cook with. Either you buy a bag of coleslaw mix or pick up a head of cabbage once a year on St. Patrick’s Day, but otherwise the humble cabbage doesn’t typically make it onto the dinner table. I’m about to change that with this delicious fried cabbage – after you try it, you’ll be eating cabbage every week! How do you make fried cabbage? 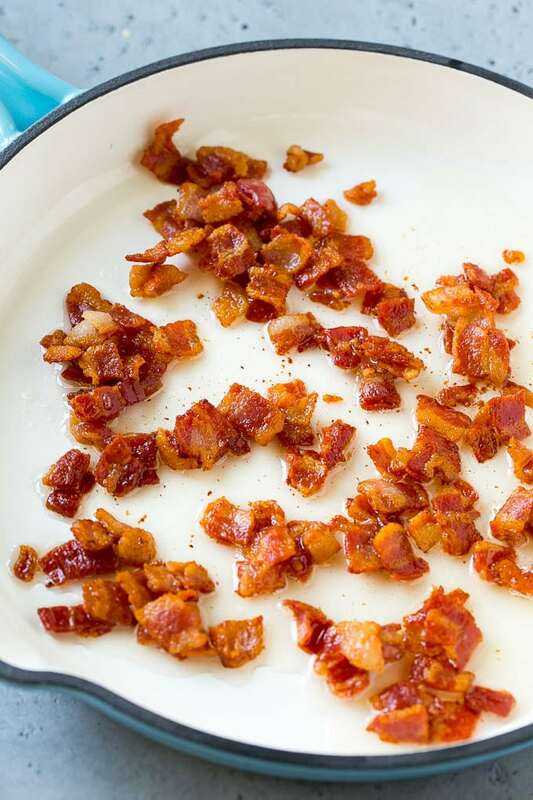 This recipe starts with bacon, which gets cooked until crisp. 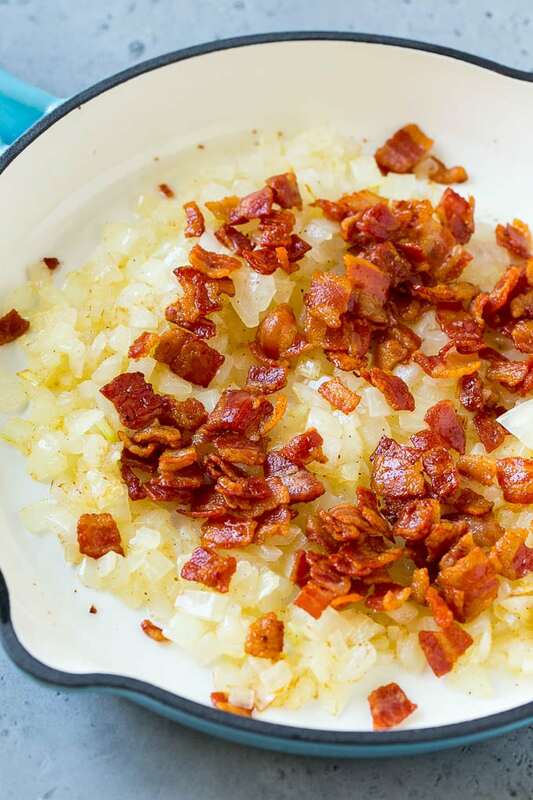 A pile of diced onions go into the bacon fat to cook, then chopped cabbage is added to the mix. Everything gets cooked together until the cabbage is wilted. Add a little parsley and you’re ready to eat! How do you core a cabbage? A cabbage core is typically tough and not optimal for eating, so you’ll want to remove your cabbage core before proceeding with the recipe. To core the cabbage, cut your cabbage head in half and use a knife to slice around the core to remove it. Cabbage is packed with nutrients including Vitamin K, Vitamin C, potassium and magnesium. Cabbage helps to improve digestion and curbs inflammation. It also has the potential to help lower blood pressure and cholesterol levels. Don’t have bacon on hand? You can try another meat such as ham or smoked sausage. You’ll need to add some oil to the pan to compensate for the lack of bacon grease if you go that route. You can make fried cabbage with different varieties of the vegetable, such as purple cabbage, Savory cabbage and the traditional green cabbage. Fried cabbage makes great leftovers, so make a double batch and save some for the next day! This fried cabbage is so good that it’s earned a regular spot on our dinner rotation, even the kids devour it. Your family is sure to love it too! Add the cabbage, sugar salt and pepper. Cook, stirring occasionally, until cabbage is wilted. You may need to add a bit of water to help the cabbage along. I put a few red pepper flakes in as well-love this dish!! !